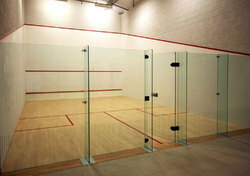 Our range of products include squash court hard plaster and squash court construction. 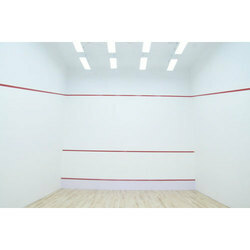 We offer Squash Court Hard Plaster for many clients throughout the country. While constructing the court, every small to big details are considered, such as straightness of walls, court markings, the strength of the wall, finishing of walls, ball rebound, joints in playing surface, wall to wall junction, and much more. The 9750 mm length and 6400 mm width single court flooring are divided into 5440 mm front side and 4260 mm back side by a 50 mm short line. The back side is divided into right and left side by half court line. Both left and right boxes have service box of 1600 mm. On the front wall, the service line in on 1780 mm length and the wall line is of 4570 mm length. The dimensions of single and double courts differ, and we undertake all kinds of Squash Court Construction work.